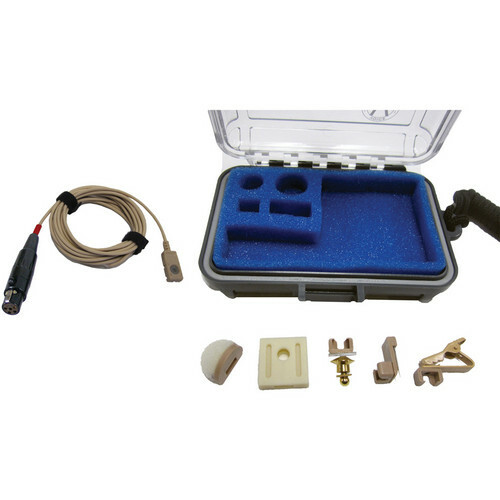 The beige Voice Technologies VT506 Waterproof Miniature Omni Lavalier Microphone with TA5F Connector for Lectrosonics Servo-Bias Inputs SMa/SMV/SMQV/UMa/LMa is a waterproof version (IPX-7 certificated) of the VT506 lavalier microphone and comes in an Otter Box case with a foam insert, an alligator microphone clip, a dracula microphone clip, a foam windscreen, a tie tac clip, and a rubber body microphone mount. The microphone is rugged and shockproof and has a flexible cable, which provides excellent isolation from handling noise. The Voice Technologies Alligator Microphone Clip VT0251 (Beige) is designed specifically for use with VT500 and VT506 microphones. Use this practical unit to perfectly position your microphone for optimum recording results. The Voice Technologies Dracula Microphone Clip VT0252 (Beige) is designed specifically for use with VT500 and VT506 microphones. Use this practical unit to perfectly position your microphone for optimum recording results. The PW/H Pro Foam Windscreen for Voice Technologies VT500 and VT506 Headworn Microphones (Beige) is a replacement windscreen for the Voice Technologies VT500 and VT506 headworn condenser microphones. This windscreen helps to reduce speaking and environmental noise, lessening pop and light wind that occurs during normal stage and broadcast use, so sound comes through crisp and clear. The color-coordinated windscreen with plastic support clips on easily for a snug, secure fit. The Voice Technologies Tie Tac Microphone Clip VT0253 (Beige) is designed specifically for use with VT500 and VT506 microphones. Use this practical unit to perfectly position your microphone for optimum recording results. The Voice Technologies Rubber Body Microphone Mount VT0208 is designed specifically for use with VT500 and VT506 microphones. Use this practical unit to perfectly position your microphone for optimum recording results. Box Dimensions (LxWxH) 5.1 x 3.6 x 1.4"